I have trouble in solving this exercise. 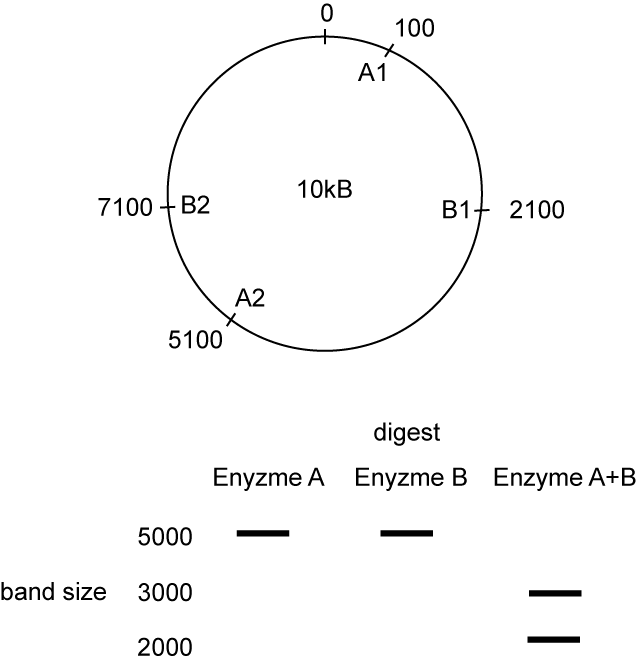 A circular plasmid of 10,000 base pairs (bp) is digested with two restriction enzymes,A and B, to produce a 3000 bp and a 2000 bp bands when visualised on an agarose gel. when digested with one enzyme at a time, only one band is visible at 5000 bp. If the first site for enzyme A(A1) is present at the 100th base, the order in which the remaining sites (A2,B1 and B2) are present is? How can a 10,000bp plasmid produce 3000bp and 2000bp only on agarose gel. I mean where are the remaining 5000bp? I dont know if my concept is right. Linearised bands on an agarose gel may be doublet. That can clear the doubts in problem. But still I dont know how to do a reasonable restriction mapping and find out sites of different enzymes. This is not as hard, as it first seems. Lets have a look at the single enzyme digests first: The digest with enzyme A and B only leads to products which are 5kB (5000 bp) away from each other. Since they are of the same size, both equally sized restriction fragments appear as one band. So each enzyme cuts the plasmid exactly in half. A1 and A2 are the cutting sites for enzyme A, B1 and B2 the sits for enzyme B. The numbers on the outside are the positions on the DNA sequence. You can see that a single digest leads to two fragments of 5kB (doesn't matter which) and that both A and both B sites are located 5kB from each other. A1 is at position 100, A2 has to be at position 5100, B1 is located 2kB behind A1 (and therefore at position 2100), and B2 2kB behind position A2 (and therefore at position 7100). To get the same restriction pattern it is also possible that B1 and B2 are located 3kB behind their respective enzyme A position (so at 3100 and 8100) and you still get the same pattern of 2kB and 3kB on the gel.